Osteopathy is a form of physical therapy focusing on the diagnosis, treatment and rehabilitation of musculoskeletal disorders and the effect of these conditions on patients’ general health. Treatments are tailored to each individual patient. Osteopathy aims to treat your symptoms but also the parts of the body that have caused the symptoms in the first place. An osteopath uses a holistic approach to restore the body to its best physical condition. Osteopaths are trained to treat many conditions of the body, although many people know us for being ‘back specialists’. Osteopaths assess and treat a wide range of patients of all ages, with a wide variety of conditions – from toddlers to the elderly and pregnant women to sports people. or advise an alternative therapy. Manipulation is a technique used to improve joint mobility. 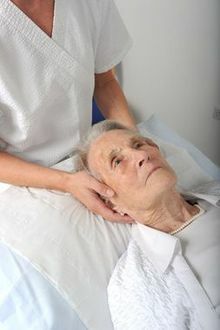 Manipulation is not used with every patient, especially in the elderly, where it would be more effective and appropriate to use other techniques, such as gently articulating the joint. In simple terms, both osteopaths and chiropractors tend to treat similar conditions. Both professions undergo an extensive 4 years training, with over a 1000 hours of clinical experience before qualifying. Osteopaths encourage the body’s own healing mechanism to repair tissues after injury or problem. Often the focus is to improve circulation to promote this. Techniques may include massage, stretching, postural, nutritional advice, exercises & range from gentle techniques to more vigorous mobilisation of joints & tissues. Chiropractors aim to improve the function of the nerve supply to the joints & tissue to improve health. Typically, this is achieved by manipulation of the spine – the ‘clicking’ that many will be aware of. Traditionally, chiropractors have utilised x-rays to examine the spine although under recent guidance this has diminished. Chiropractic treatment sessions tend to be shorter & more frequent than osteopathy. Physiotherapists aim to restore function & movement. There may be ‘hands on’ work but much of the treatment is likely to be through prescribed exercises. Training is via a 3 year degree course. An Osteopath must study for four to five years to gain their qualification. By law, osteopaths must register with the General Osteopathic Council (GOsC) making it an offence for anyone to call themselves an Osteopath, if they are not registered.